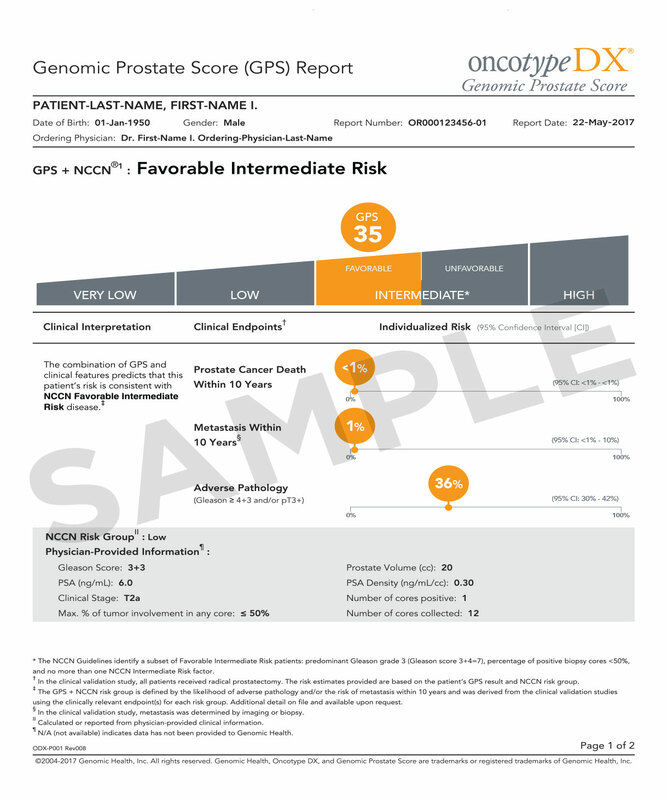 The Oncotype DX Genomic Prostate Score (GPS) assay is the only genomic assay designed for men with clinically low-risk or favorable intermediate-risk cancer to help make treatment decisions at the time of diagnosis. The assay analyzes prostate cancer gene activity to predict disease aggressiveness. Provides a GPS result ranging from 0-100 that corresponds to the biologic aggressiveness of the tumor. Measures biology through the expression of 17 genes across four important genetic pathways and, in conjunction with clinical risk factors, predicts the likelihood of adverse pathology, prostate cancer death, and metastasis at 10 years1*. Adverse pathology is the presence of high-grade (Gleason Score >4 + 3) and/or non-organ-confined disease (pT3+). It provides an immediate snapshot of the risk of aggressive disease at the time of biopsy. Biopsy alone often misses patients with high risk of adverse pathology. 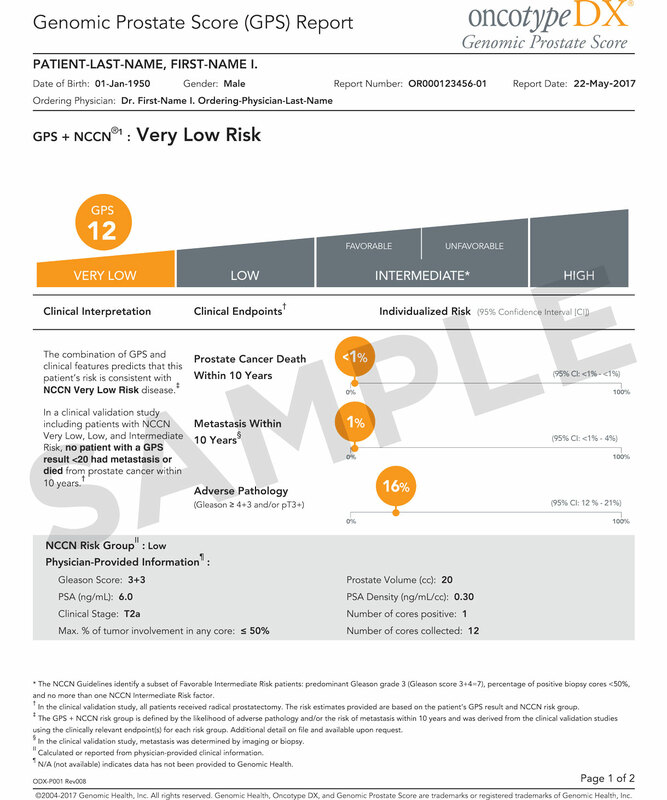 The Oncotype DX Genomic Prostate Score test provides a comprehensive risk profile for personalized information to guide treatment decisions. NCCN Guidelines include the GPS assay as a Category 2A molecular testing option for consideration in prostate cancer patients with clinically low-risk and favorable intermediate-risk disease (life expectancy >10 years). The Oncotype DX GPS reveals the underlying tumor biology in clinically low-risk patients to provide actionable information for treatment or management planning. The Oncotype DX GPS assay provides meaningful information on the aggressiveness of the tumor that, when combined with clinical pathologic features (PSA levels, Gleason score, anatomic stage, and NCCN® risk classification), helps when discussing management options with patients. 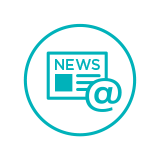 The GPS report is a patient-friendly resource that facilitates discussions by consolidating key prostate cancer characteristics in a single document for ease of reference during management conversations. 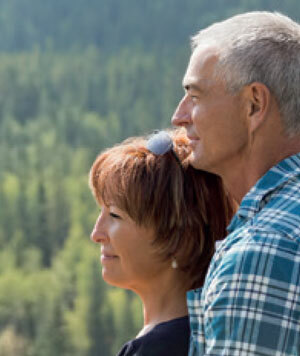 The Oncotype DX GPS assay has been developed and studied in over 4,500 patients.3 The results from the assay refine risk assessment, help guide treatment decisions, and potentially impact patient quality of life. For example, the results might give a low- or favorable intermediate-risk patient the additional confidence he needs to pursue active surveillance, delaying or even completely avoiding the side effects of more aggressive treatment options like prostatectomy or radiation therapy. 1. Klein et al. Eur Urol. 2014. 2. Cullen et al. Eur Urol. 2014. 3. Van Den Eeden et al. Eur Urol. 2018. 4. Kozminski et al. Eur Oncol. 2016. 5. Eggener et al. J Urol. 2011. 6. Knezevic et l. SUO. 2013. 7. Data on file. Genomic Health, Inc.
8. Badani et al. Urol Pract. 2015. 9. Dall’Era et al. Urol Pract. 2015. 10. Canfield et al. Reviews in Urol. 2018. 11. Lynch et al. Am J Manage Care 2017. 12. Albala et al. Rev Urol. 2016. 13. Bonham et al. USCAP 2016. 14. Salmasi et al. J Urol. 2018. 15. Eure et al. Urology 2017. 16. Leapman et al. PloS One. 2017. * Kaiser Permanente Northern California (KPNC) retrospective cohort study N=279 clinically low-, intermediate-, and high-risk patients; biopsy. This study estimated 10-year mortality and metastasis risk based on patients after radical prostatectomy. †University of California, San Francisco (UCSF) prospective validation study: N=395 clinically low-risk patients; needle biopsy. ‡ Center for Prostate Disease Research (CPDR) prospective validation study: N=402 clinically low-risk patients; needle biopsy. 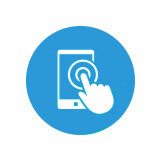 Take an interactive tour of the Oncotype DX Genomic Prostate Score report. How does the overall clinical picture look? 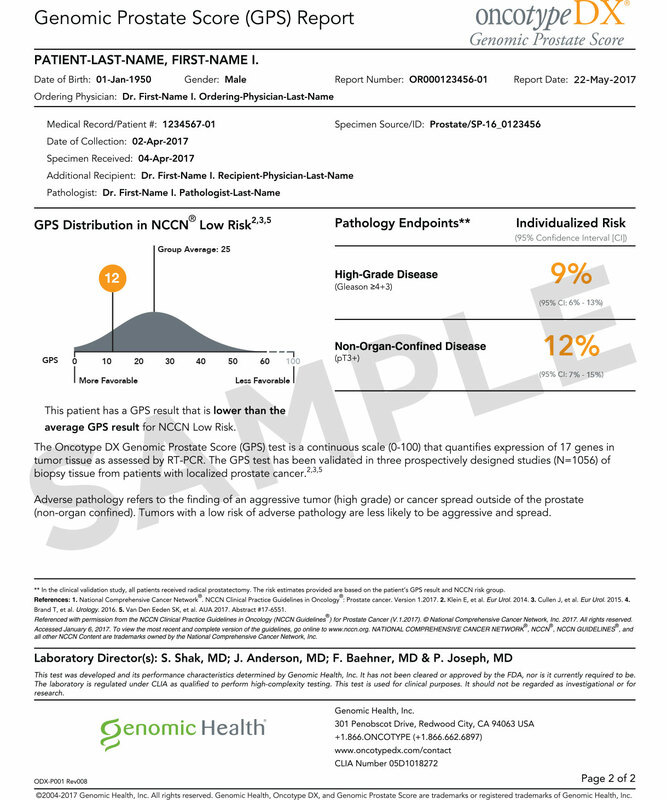 By combining the Oncotype DX Genomic Prostate Score® (GPS) result with clinical features, the report provides clear risk stratification. What do long-term outcomes look like? 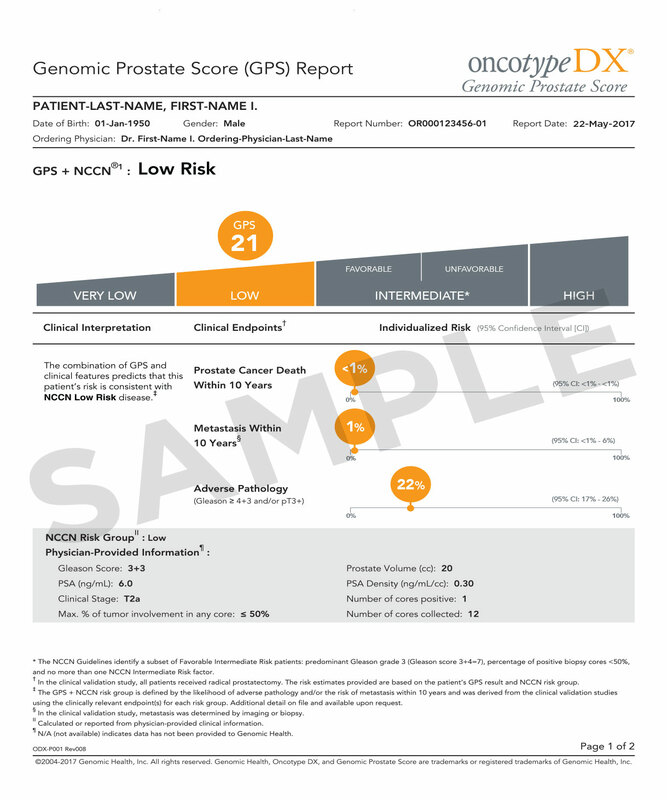 The Oncotype DX Genomic Prostate Score® has been prospectively validated to independently predict 10-year clinical risk of prostate cancer death and metastasis. *From the KPNC clinical validation study, in which all patients received radical prostatectomy. How aggressive is the underlying biology? 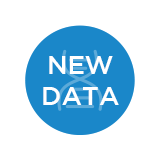 This single number is the most immediate and clinically actionable endpoint, predicting the patient's likelihood of adverse pathology (Gleason ≥ 4+3 and/or pT3+). *From the UCSF and CPDR clinical validation studies. In this example, the patient's clinical features are consistent with NCCN Low Risk. Utilization of the GPS Test™ enables reclassification to NCCN Very Low Risk. How does your patient's GPS result compare to his pre-test risk group? Helps to personalize your conversations for shared decision-making about treatment options. *From the KPNC, UCSF and CPDR clinical validation studies. 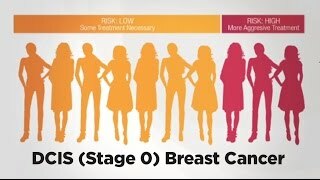 What is the risk for disease progression? 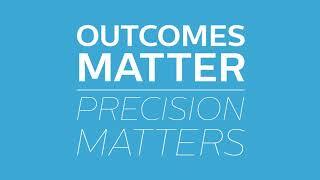 Get your patient's individualized risks for high grade disease and non-organ-confined disease. *From a meta-analysis of the UCSF and CPDR clinical validation studies.. In this example, the patient's pre-test NCCN risk was Low. GPS testing enabled reclassification to Very Low Risk, providing strong support for a conversation about Active Surveillance. *National Comprehensive Cancer Network® clinical practice guidelines for prostate cancer. In this case, GPS testing confirmed a pre-test Low Risk result, potentially reinforcing confidence in Active Surveillance. In this final example, the GPS result reclassified the patient from Low to Favorable Intermediate Risk. Active Surveillance may still be an option after careful consideration of adverse pathology and patient preferences. 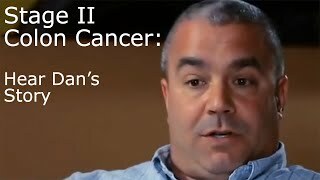 The Oncotype DX Genomic Prostate Score test is now covered by Medicare for favorable intermediate risk prostate cancer. In a large clinical data set of nearly 9,000 low risk prostate cancer patients, GPS utilization revealed a significant increase in AS. Kaiser Permanente of Northern California assessed the association between GPS and two hard endpoints: metastasis and prostate cancer death in a cohort of 279 men.